As a child growing up in suburban Chicago, I always looked forward to summers and going to camp. When I was in elementary school, I attended a traditional day camp where you got a little bit of everything: swimming, archery, arts and crafts and, of course, color wars. During the teen years I spent summers in the Wisconsin woods, riding horses, playing jacks, talking teen angst and making lifelong friends. Know what you are looking for: Do you want an academic or activity based camp? Is your child interested in a sports camp? How long do you want them to go to camp? When looking at a camp, ask: does it have a history? 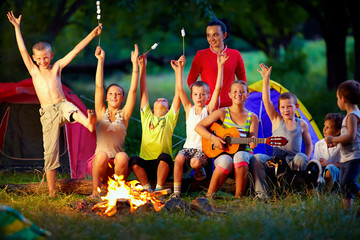 Many established camps have directors and counselors who come back year after year. This helps to establish a sense of consistency and community. A camp wouldn’t stay in business for many years if it wasn’t well run. Does the camp have a high standard of accreditation? Do they do background checks on all staff? Check it out with the Better Business Bureau. Talk to other parents whose kids have gone to a particular camp. What is the camp’s communication plan? This pertains to both information about particular activities as well as in the event of an emergency. Cell phone policy: Many camps don’t allow kids to have access to cell phones. Is this a policy with which both you and your child are comfortable? Camps can also be quite pricey. You might want to consider your budget before you attend one of the many open houses that camps have at this time of year. The ability to send your kid to camp is one of the greatest gifts a parent can give a child. Good luck in making the best choice for you and your family!! !